Future Barker Creek Community School students, staff and family members saw their new—permanent—home for the first time on Tuesday evening. But they had to use their imaginations. 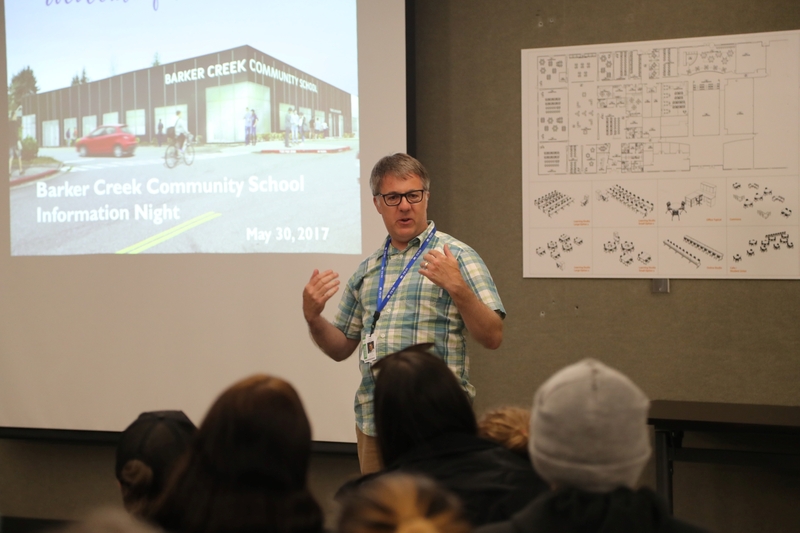 Nearly 100 guests and staff members visited the building on May 30 to learn more about plans for the school. With construction underway, the 30,000+ square foot area was mostly empty. So district officials helped participants visualize the end result using floor plans and renderings. The lack of walls did not hamper enthusiasm. The new school will have 14 learning studios, wet and dry labs, a fitness center and a lunch room. The layout is open concept and flexible. This will help meet a wide variety of student learning styles and needs. After they move in next fall, students and staff will choose school colors and other elements that define their school’s identity. The school’s labs, learning studios and other areas are scheduled for staff move-in this summer. The first day of school will be September 6, 2017.